Super easy to follow step by step instructions that help you accomplish certain tasks in and around Football Manager. A tutorial on how to find & download the official Football Manager 2019 Pre-Game Editor on Steam. Plus a brief overview of the FM 2019 Editor's new features. Part 3 of the skinning guide for FM 2018. In this part, Michael explains how to edit the font and text settings. Football Manager 2018 changed the template for 3D kits. This tutorial will guide you on how to make them. Michael Murray walks you through skinning basics and explains how to set up your first FM 2018 skin. A simple guide explaining how to extract the fmf files that contain the default files for FM 2018 and explains the file structure of the files to make it easier for people to modify the game themselves. The place in your hard drive where FM18 game data and user data are stored. This includes saved games, tactics, shortlists, but also custom graphics and skins. A brief tutorial that outlines how to replace the default pitch textures of the 3D match viewer. This guide is specific to Football Manager 2018. How to make the German and Japanese national teams playable in Football Manager 2018. This fix for FM 2018 will unlock Germany and Japan with real players. A tutorial on how to find & download the official Football Manager 2018 Pre-Game Editor on Steam. Plus a brief overview of the FM 2018 Editor's new features. How to make the German and Japanese national teams playable in Football Manager 2017. How to execute a Wonderkid Academy run. May require live editor. I did this successfully on FM16 as Londrina. A tutorial that showcases how to find and download the official Football Manager 2017 Pre-Game Editor on the Steam app. Plus a brief overview of the FM 2017 Editor's new features. How to make the German, Chinese, South Korean and Japanese national teams playable in Football Manager 2015. From world leagues over your local regional league to new continental competitions. There are few limitations to what you can achieve in the Football Manager Pre-Game Editor. Ever wanted to create kits for Football Manager? This step by step guide will help you get to grips with the process. A step by step guide on how to find and download the official Football Manager 2015 Editor on Steam. This tutorial explains the process of adding graphics to FM14, but it's the very same procedure for any FM version. A guide to create your own cut-outs, for a whole facepack or just a single player. How to play a network game of FM without having to use Hamachi. 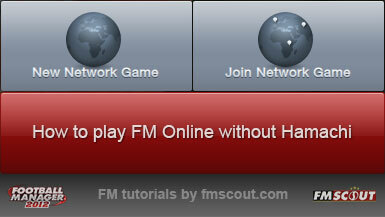 How to host or join a network game and play football manager online with friends using Hamachi. Handcrafted in Symi, Hellas. Page created in 0.831 seconds.